I have yet to find my bride, but I have already found my honeymoon location. In fact, I have already honeymooned there. Some people say to reward yourself first and the desired result will come. The idea is that if you get a taste of what you want in life — even if you are not ready for it or cannot afford it — you will get accustomed to the feeling and your vision will soon become your reality. Well, I have now had a taste of honeymooning in Bora Bora. A beautiful bride will surely come. At the moment, though, I am busy with traveling to every country in the world by the time I turn 30, so I will save the bride and the real honeymoon for a later date. 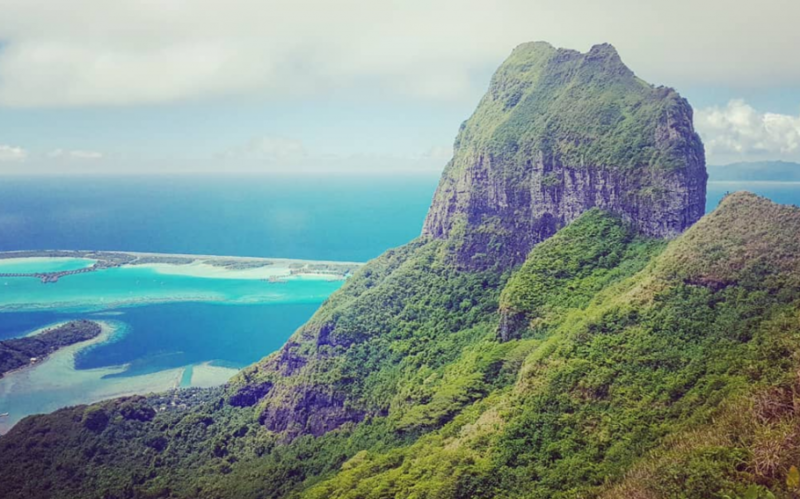 Arriving by air in the pearl of the Pacific, Bora Bora, I embarked upon the third and final green-ridged island visit of my Polynesia trip. 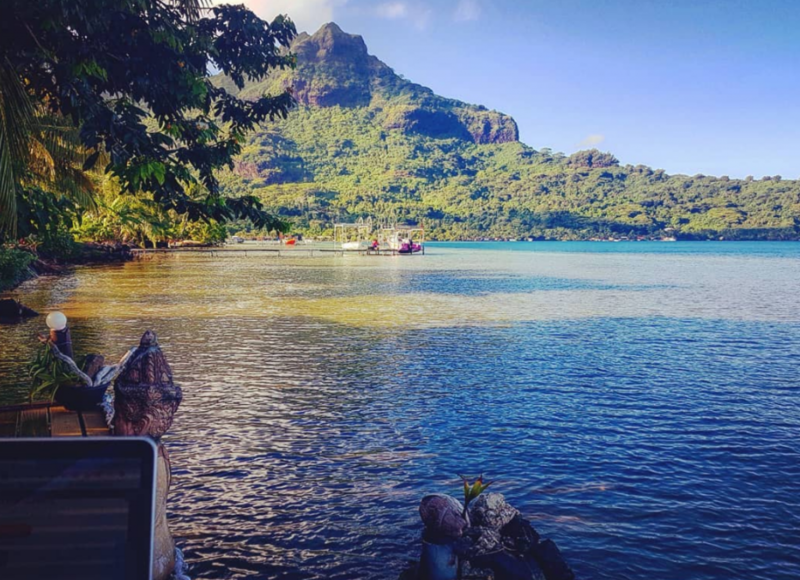 Before arriving, I said I was leaving luxury behind in Moorea. I did. But my accommodation actually improved in Bora Bora. 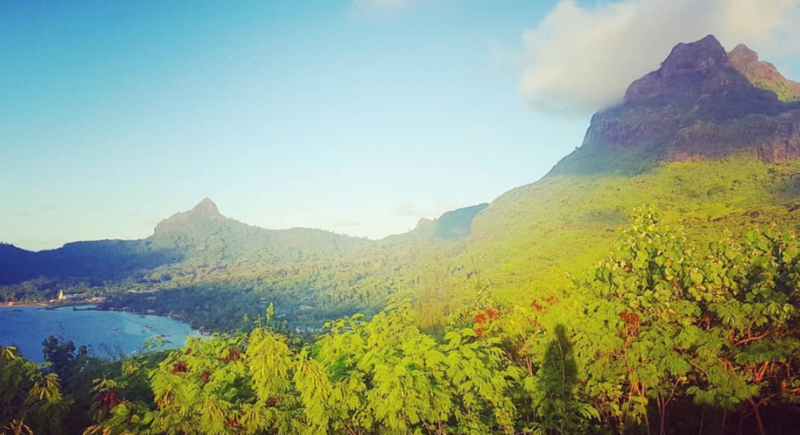 How do you beat a suite at the Hilton Moorea Lagoon Resort and Spa? You get an overwater bungalow with a much more natural feel in Bora Bora. At just $120 a night, it is quite a deal. For the price of a room at Anarchapulco, you get an overwater bungalow on the deepwater side of the island. It’s part of a small community of tranquil huts nestled under palm trees and other greenery. Snorkeling again awaits. This time my honeymoon partner and I got to share a lovely outdoor office. We sat together, laptop on my lap, next to the water and looking straight ahead at a lustrous green peak. Trees hanging over the water provided us shade, as we worked together to type emails and communicate with clients. Unfortunately, my laptop got a little jealous. I whipped out my Kindle to do some reading. It was the perfect setting and I hadn’t done so much reading in recent months, so I couldn’t resist the temptation. Anyway, despite being on a honeymoon, I was still a single man with options. It was a hard truth for my laptop to accept. My laptop tried to seduce me with tantalizing images, but I resisted. We stayed close on the honeymoon, and my laptop enjoyed priority seating on my lap while we relaxed at our beachfront office. Nonetheless, we kept things platonic. After all, it is my future bride who gets to enjoy all of me in Bora Bora. People in Bora Bora are chill. When I showed up, my host gave me the keys to his car to cruise the island for the afternoon. How hospitable is that? My exploration of the island led me to a hike that takes you to World War II cannons. During World War II, the Americans set up a South Pacific base. It was here in Bora Bora. They militarized the island and some cannons remain. 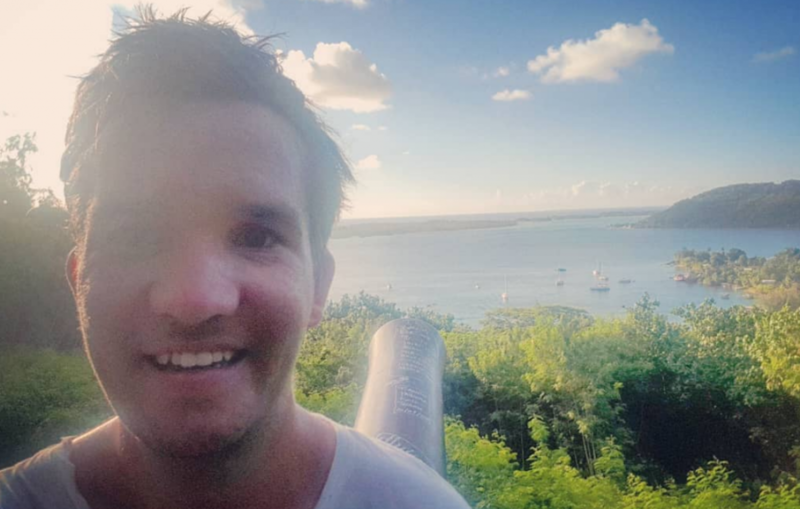 I decided to take a photo while sitting on one of the old cannons. Some observers mistook the image as a phallic symbol. 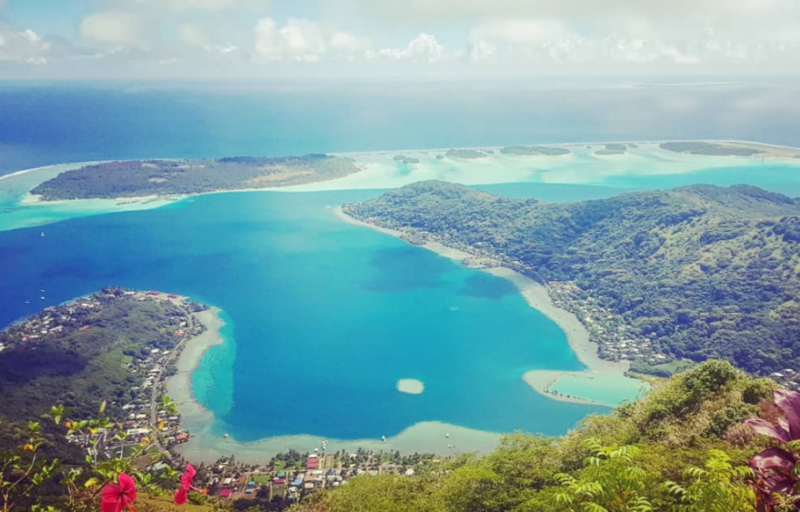 Though I was on a relaxing honeymoon, there was one thing I had to do in Bora Bora that would be very physically exhilarating. 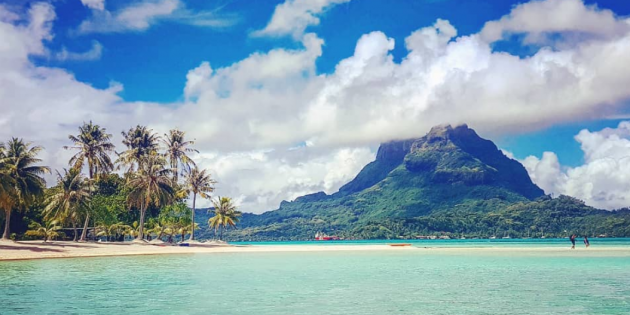 Bora Bora has a mountain — an approximately 750-meter peak — that has a magical aura. The mountain’s aura was drawing me in, so I found the one guide on the island who could lead me to the peak. It was an exhausting eight-hour hike that proved to be more difficult on the way down than the way up. At one point, I had to use a total of five ropes to go down a stretch of 200 meters. When I finally made it down, I felt reborn — as if I had overcome any and all physical limitations. In fact, honeymoon and all, I became so motivated that I decided to use the climb as the kickoff of a viewpoint hiking fitness program — something I am now doing every few days. You may thing I have forgotten to mention the view at the top of the mountain. Wrong. 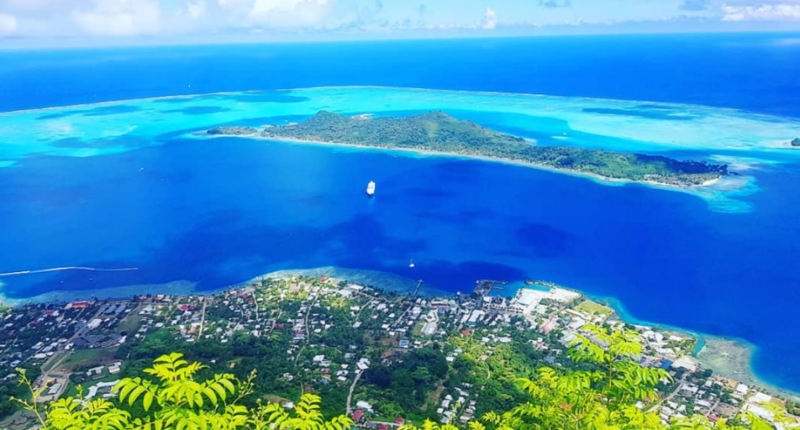 From 700-something meters high, you get a panorama of Bora Bora — the island, its green mountain ridge, the surrounding multi-colored water and, of course, the luxury overwater hotels. Those competing overwater hotels offer rooms that start at about $1,000 a night. Stay: Bora Bora is most famous for its 7 operating luxury overwater resorts. I chose the much cheaper but equally nice option on the main island. 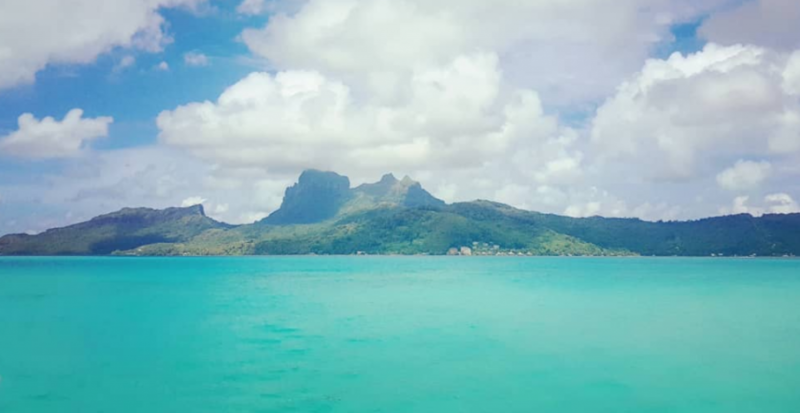 Bora Bora Bungalove, a own bungalow for myself just at the water at the deeper side of the lagoon was the best place. Being the only guest, I had a water-facing terrace and a great house reef for snorkeling. The friendly hosts rented me their cars, bicycles and gave me great tips of the island. Eat: With a full kitchen I chose to prepare my own meals. There is Bloody Marys though, a famous restaurant, but apparently overpriced with not so good quality. I just went for a beer. Drink: See above. I just tried Tahitian beer the first time – it is called Hinano and actually not that bad. Connect: It is the pearl of the Pacific – so certainly the internet had to work and it did. See: Matira Beach is really like the postcards – and its actually the only really beach on the main island. Go there at sunset. Do: If you are not there for honeymooning only, take on the challenge of some hikes. First start with a walk up to the old WW2 canons which you can climb for some selfies. Then hire a guide to bring you up the big mountain of Bora Bora. Several people die each year attempting it themselves – so better dont do it alone. Bring more than plenty of water and a physical condition sufficient enough to hike 8h straight very steep up and down. You will need to use your arms in 5 different locations drawing yourself up a rope. It is a physical and mental challenge – but the views from the top are amazing. 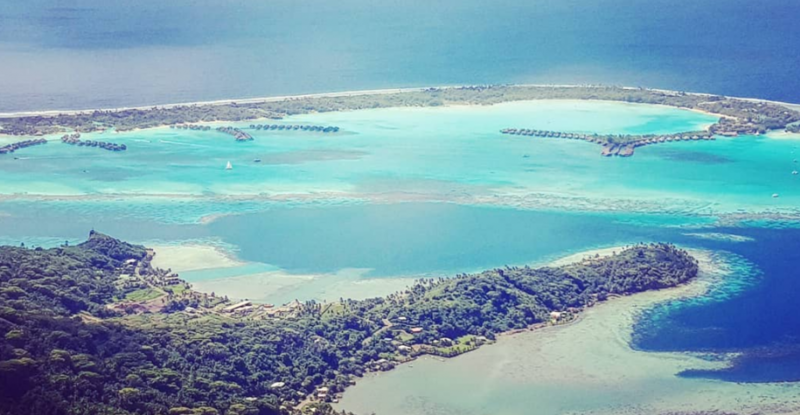 Go there: Fly to Bora Bora over Tahiti or Moorea. There is also a daily flight from the Tuamotus.